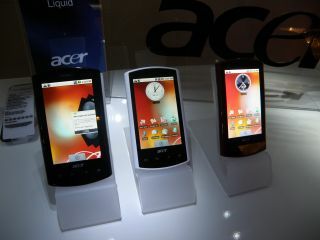 Acer has announced its new range of Android smartphones, dubbed the 'Liquid' series, and has brought with it some industry leading specs too. The phone will be packing Android 1.6, which allows manufacturers to release devices with a higher resolution screen. This has resulted in the industry's first QVGA (800 x 480 pixel) screen, giving the best experience on a mobile for video and web browsing. The grunt is there too - Acer has nabbed the Qualcomm Snapdragon 1GHz processor, previously used in the TG01 and forthcoming the HTC HD2, and this will help speed Android up no end. And in keeping with today's Android skins - Acer has promised YouTube, Facebook, Twitter and Flickr integration with contacts, meaning you're able to interact with them easily from within the phone. The overall Android experience is very similar to the HTC Magic from the outset - apart from some scrollable tweaks - but it's under the bonnet that is going to set this phone apart from the rest, with 3D graphics possible thanks to the upgraded processor. There's no official UK release date as yet, but we've heard that it will be coming around December this year, so you might want to put it on your list to Santa. We're publishing a full hands-on with the phone later today, so get ready for a full range of pictures with the Acer Liquid Android phone.